We are delighted to announce that MOSPS has been awarded the Eco-Schools Green Flag Award. This is the highest award available to schools and reflects the dedication and hard work of our Eco-Leader Mrs Adams and her terrific team of Eco-Warriors. ‘I would like to congratulate you all for the time and effort that has been invested in environmental education at your school. Your award is well deserved and reflects the hard work you have put into the programme so far. The school’s commitment to improving its grounds to accommodate the needs of children of all ages is very clear. As a result, the school grounds are delightful and make a significant contribution to children’s learning experiences. Energy saving has been taken very seriously and measures undertaken have resulted in a marked reduction in the use of fossil fuels and this is reflected in the school’s energy budget. The children have an excellent understanding of the solar panels and heat pump that have largely brought this about, and Year 6 children were able to give both me and the Eco Warriors an excellent presentation. The Warriors’ understanding when tested by Year 6 after the presentation was very impressive! Congratulations to them and to the delightful Eco Warriors who provided a wonderful assessment visit. In many ways, this is only a start and It’s important to recognise that being involved in Eco-Schools is a process of continuous improvement towards being sustainable. Once we’ve celebrated achieving the Green Flag, we will take stock and decide where we would like to take our school next. If you have any ideas for a more sustainable MOSPS or can offer help or expertise, please contact Mrs Adams directly. There are 533 schools in Hampshire and only 17 have the Eco-Schools Green Flag Award. The mission is to help make schools more sustainable and to bring about behaviour change in young people and those connected to them so that good habits learned in schools are followed through into homes and communities. MOSPS currently holds the Eco-Schools Silver Award and is aiming to gain the ultimate Green Flag by the end of 2016. Mrs Tanner helped us label the new bins. Rachel talked about how special Planet Earth is. Rachel looked through our recycling bins. Some things were in the wrong bins! What a great session in our Eco-pod! 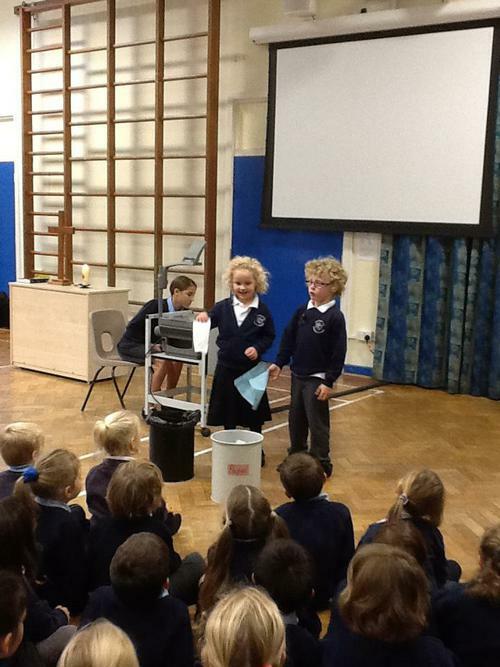 The Eco-Warriors have been teaching the school about what things can go in the white recycling bins and what can't. Our Eco Mascot - Tobermory! Tobermory is given out to the best "green" class.